Nutravita is a reputable UK brand with a large following. Today we review what they call their ‘all natural’ ingredient biotin supplement called High Strength Biotin. But, you may be asking, what is biotin and why is it important? Biotin is also known as vitamin B6, and as is the case with all vitamins, it is an essential nutrient for the body. Without it, you cannot metabolize food, which is why it is also classified as coenzyme R, an enzyme being what is required to digest food and a coenzyme being what is additionally required in this process. The most visible signs of good amounts of B6 are healthy hair, skin and nail growth and appearance. Often, cancer patients, for example, are advised to take biotin to make their hair grow back. Some women also take this after a pregnancy to restore strong hair and nail growth, as much of the biotin reserves would have been used to fuel embryonic growth. The last two ingredients are anti-caking agents while the first two are bulking agents. This formula is unusual as it also contains coconut oil, which is considered to be a metabolite in the keto diet especially. Coconut oil is thought to have many benefits, including lowering bad cholesterol and therefore protecting the heart. Coconut oil of course also improves the quality of skin and hair, so it would add to the visible benefits that biotin brings in these aspects. This dose of biotin is a maximum strength one and is about 2000% the recommended daily intake. You need extra amounts if you have been deficient. Take one tablet per day, preferably with a meal. Do not administer to children. Stop taking the tablets if you experience any negative reactions. If you are pregnant, breastfeeding, taking any medication or under medical supervision, consult a doctor before proceeding to take this supplement. A bottle contains 365 tablets and it retails for $32.80 on the product website. There are no bigger sizes as this is a year’s supply. At the time of compiling this review, there was a 50% discount on Amazon. On the Amazon feedback page, this supplement gets good reviews and the same is true on the product website. The returns policy is a bit of a drawback as you must indicate that you will be doing so within 14 days, and the bottle must be returned in the same condition in order to get your refund. This means you cannot open it and try a few pills. This supplement consists of a small tablet that is easy to swallow. It is vegan and vegetarian-safe and absorbs into the body quickly. The product does what it says it will as consumers report good, thick hair growth even after cancer treatment and stronger nails. 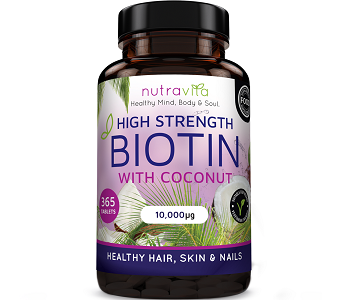 The dose is high and coconut compliments the intended effect of biotin. Virtually the only drawback of this supplement is the returns policy, and perhaps this big size bottle, depending on how you look at it. On the one hand, you need a yearly supply as supplementing with biotin is not a short-term endeavor. On the other hand, if you’ve bought a big bottle for which you’ve naturally paid more than you would have said for a bottle containing 100 tablets and with a similar strength of biotin, and for some reason the supplement causes you aggravation, you’ve forked out a lot and can’t return it because you’ve sampled some capsules. Some people who have been through high-medication experiences do find that they have a heightened sensitivity to bulking and anti-caking agents, in which case you may just find the product makes you nauseous or gives you another side effect. If this is a concern, opt for a smaller bottle from a manufacturer who also formulates 10 000 mcg biotin tablets, but that has a solid return policy so that even if you buy smaller bottles in bulk at a discount, you can return what you don’t use if need be, and get your money back.